Le paysage urbain historique de la ville de Djibouti et ses bâtiments spécifiques is part of the Tentative list of Djibouti in order to qualify for inclusion in the World Heritage List. Site visited in May 2018, during extremely hot weather, which might have influenced my opinion about the capital of Djibouti. And unfortunately I cannot say many positive things about Djibouti ville. The capital is in fact ugly and disorganized, despite the fact, that the whole country is not that poor (it is very expensive even for Westerners). Goats and sheep can be seen even in the very center of the city. The historical buildings are generally in very bad condition, except a few those used by government or municipality. The description of this TWHS mentions those nice ones, like Presidential Palace or City Hall, but if you go to the main square, called la Place du 27 Juin, you will see almost nothing but mess. It is even difficult to recognize colonial heritage of the city, as historical buildings are surrounded by newer ones, without any visual integrity. The best summary of so-called “cultural landscape” of Djibouti city is the fact that it is one of few capitals that don’t have ANY museums. 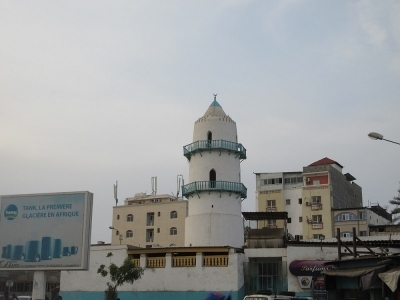 The photo shows Al-Hamoudi Mosque, one of the oldest mosques in the city.